Buy 3 for $75, Get 1 FREE!! All packages include 30 servings. 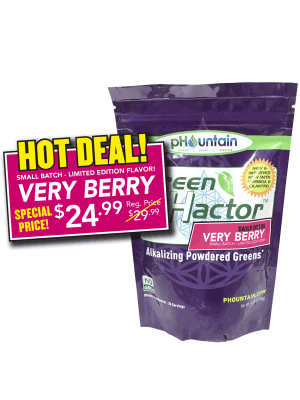 Try our limited-time new delicious flavor of Green pHactor -- VERY BERRY!! What’s Great About Green pHactor? As you know, when you are living an alkaline lifestyle, it is vital you consume highly absorbable vitamins and minerals from a micronutrient-rich diet full of biologically “active” plant foods. Green pHactor is a powerful way to provide your body with important plant-based foods while also supporting your immune system!